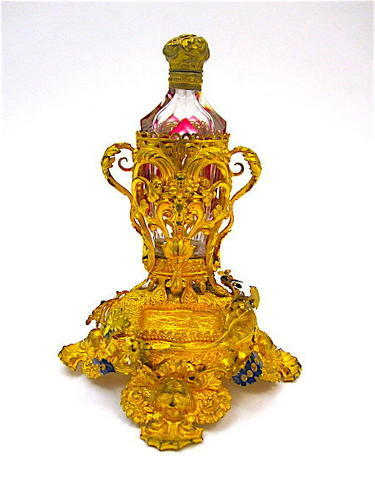 Antique Palais Royal Perfume Set Comprising of Elaborate Dore Bronze Stand with Double Handles and with 4 Shell Shaped Feet Flanked by Flowers and Surmounted by a Female Head. The Front and Back of the Stand Have a Heart Shaped Scroll Pattern with a Female Figure in the Middle. Pretty Blue Enamel Leaves Surround the Base. The Cranberry and Clear Perfume Bottle has a Fine Dore Bronze Top.